As even die-hard enthusiasts for the global warming scare campaign begin to admit that they are losing the battle to keep the public alarmed, it is time to examine how this doomsday movement has been sustained for two decades. A 2/28 Wall Street Journal piece by Holman W. Jenkins Jr ("Jenkins: Personal Score-Settling Is the New Climate Agenda"), started out with a great recitation of efforts to silence and marginalize critics of man-caused global warming, describing them "indications of a political movement turned to defending its self-image as its cause goes down the drain." Much like other recent articles analyzing the impending death of the global warming crisis, Jenkins fails to ask a simple question: what kept the whole so-called global warming crisis from circling the drain for the last two decades? The “crisis” was arguably dead on arrival from the early 1990s when skeptical climate scientists offered science-based criticisms that apparently fatally undermined those of the United Nations' Intergovernmental Panel on Climate Change (IPCC) which Al Gore unquestioningly endorsed. It should have been no surprise to anyone that Gore and his enviro-activists friends felt a need to marginalize climate scientist skeptics in the eyes of the public, to the point where nobody would ever give the time of day to them. Gore and friends ultimately boiled their message down to an easily memorized 3-point mantra around 1996: "the science is settled" / "skeptic scientists are industry-corrupted" / "reporters may ignore skeptics for the prior two reasons". If you are asking yourself, "what skeptical scientists?," then the brilliance and effectiveness of that last talking point shines through. Despite widespread cries from enviro-activists and reporters that skeptics are given unwarranted attention, when is the last time you saw a global warming news report where skeptic climate assessments were thoroughly spelled out? And how many times have you seen that done in the twenty-year history of this issue? Try applying those two questions to one of America's most respected TV news outlets, the PBS NewsHour. 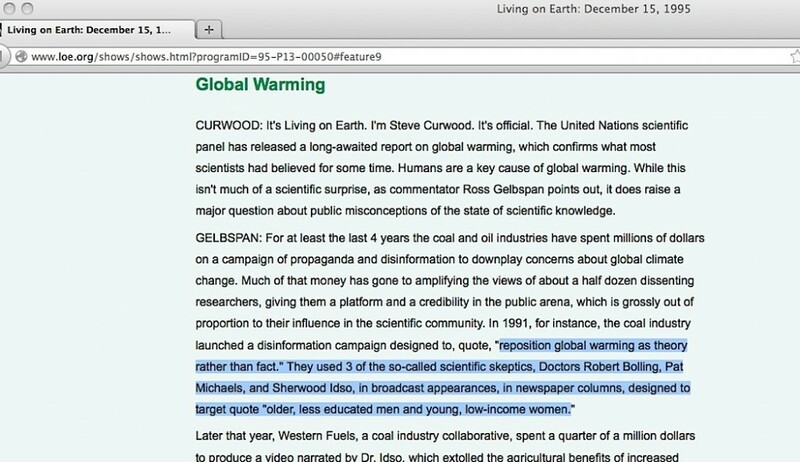 From my ongoing detailed count of their own online broadcast transcripts from 1996 to the present, they have had around 400 instances where the global warming issue was discussed or at least mentioned in a significant way on their program, and their viewers were only given skeptic science points five times, four of which were fleeting enough to be easily missed. Oops. The idea of "balance" given to climate scientist skeptics vanishes in a puff of smoke. Except neither Gore nor Gelbspan -- or anyone else who repeated the accusation -- ever bothered to provide us with full context document scans, undercover video/audio transcripts, leaked emails, money-transfer receipts, or other actual physical evidence to prove such a blatantly corrupt association exists. 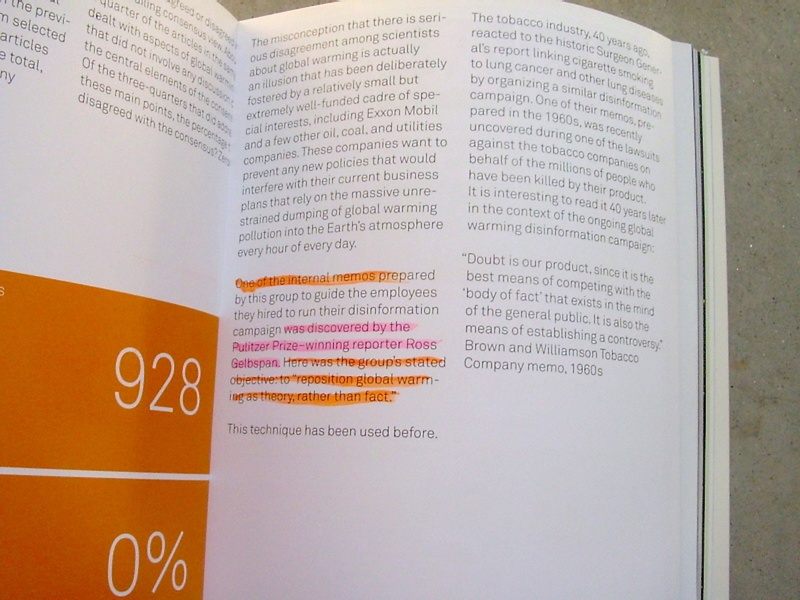 Dig hard enough to find and read the full context of the coal industry leaked "reposition global warming" memos Gore and Gelbspan claim are smoking gun evidence of skeptic climate scientists' guilt, and you soon realize the memos are part of a tiny short-lived pilot project PR campaign that practically none of the public saw. 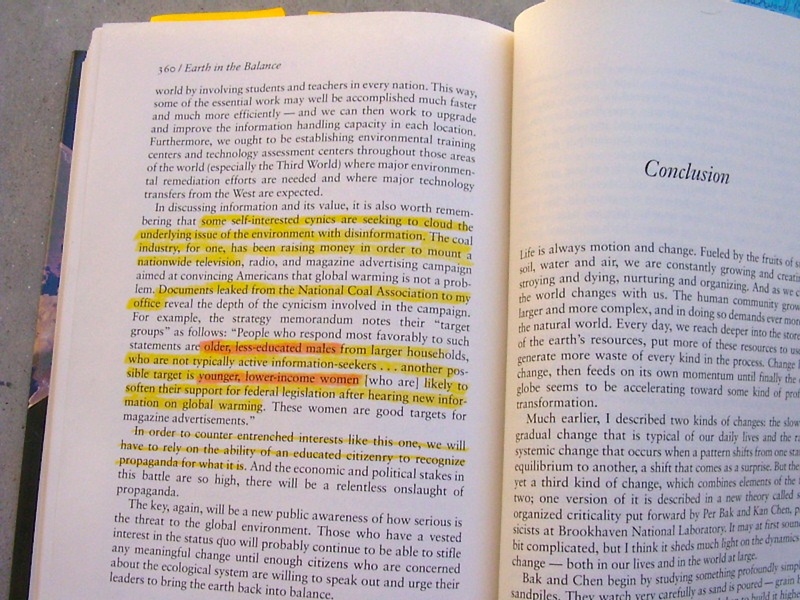 Worst of all for Gore, his companion book for his movie said the Pulitzer-winning reporter Gelbspan discovered the leaked memos, but Gore's 1992 "Earth in the Balance" book quoted from those same memos years before Gelbspan first mentioned them. And Gelbspan never won a Pulitzer. Oops. Now this situation no longer looks like any kind of credible claim that skeptic climate scientists were manufacturing doubt about the science at the behest of the fossil fuel industry; it instead takes on the appearance of a concerted effort to manufacture doubt about any critics of man-caused global warming. As the so-called global warming crisis looks ever more like it's headed toward certain collapse, tough scrutiny of all the efforts to erase skeptic climate scientists from the public eye may end up revealing the most inconvenient truth of all: the global warming issue has remained alive all this time through constant questionable infusions of information about its science claims, and through unsupportable character assassination of its critics. If the idea of man-caused global warming is exposed to have been faulty from the start, it could end up as the biggest ideology collapse of all time. Russell Cook's blog GelbspanFiles.com is a forensic examination of faults in the corruption accusation against skeptic climate scientists. He can be followed on Facebook and Twitter.